For the operation of the Cobalt Mine at Kwatebala mine pit, Tengke Fungurume Mining S.a.r.l. (TFM) need to develop haul road between Kwatebala and Fungurume, for various purposes. This haul road will cross an existing railway line, hence an overpass is required. Three different approaches have been studied by TFM ie : railway line at grade on the existing ground, at excavated line ; or at fill embankment, all of them with haul road flies over each of the option. For the purpose of Feasibility Study stage, TFM has decided one approach, which is railway at grade on the existing ground. 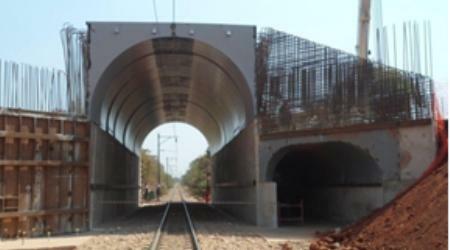 BITA was requested to carry out a Feasibility-level design for a railway crossing Fungurume. Feasibility-level design which has been assumed for one location only with rough dimension of : 22 m wide for haul road to pass over it. Railway line considered is only one line with approximately 5 m inside wall to wall distance. 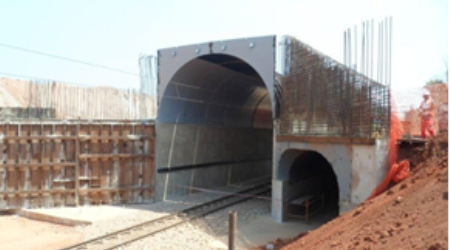 The overall works cover the followings: Overpass including its related footings. Manway for man and bicycle with approximately 3 m diameter. Earthworks and its required haul road pavement. Preparation of Structural Calculation based on the provided loads. Preparation of drawings at Feasibility level. Preparation of Bill of Quantity and Rough Cost Estimate.